ID confirmed by Arthur Shapiro. I just have to say this may be my favorite butterfly shot in the guide. There are a lot of nice butterfly shots in the guide! It's a treat when a nice fresh subject decides to cooperate and pose on a pretty plant with a nice background in decent lighting ... and I have my camera with me ... all those things don't usually line up at the same time. This is absolutely fantastic! Great shot! This is a new one for me, I will be looking for it when I go west, next month. Very nice shot! Wonder if they are talking about this same butterfly? The subspecies Euchloe ausonides insulanus (Island Marble) that occurs on San Juan Island in Washington State is endangered. See here. Our local Marble species is very difficult to shoot due to skittishness and the scattered local populations. So the quality of this shot should be appreciated by those of us who have chased marbles on our knees through the hillside grasses and failed. Very fine image. Excellent. I agree with all. Beautiful shot. Yes, this is a real crowd pleaser! Beautiful. 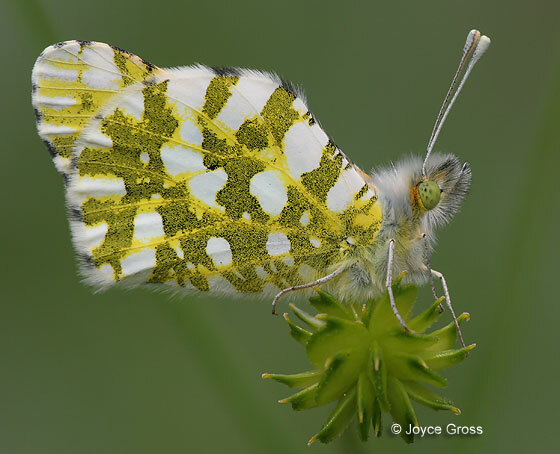 I just saw this species fo the first time just recently and was delighted to find such a beautiful butterfly, I even got some photos which I'll post, but nothing like your shot. It's perfect. you managed to get both the head and wing perfectly focused and the color balance is perfect. Contact me sometime if you want to go out and look for butterflies, I live in San Ramon.